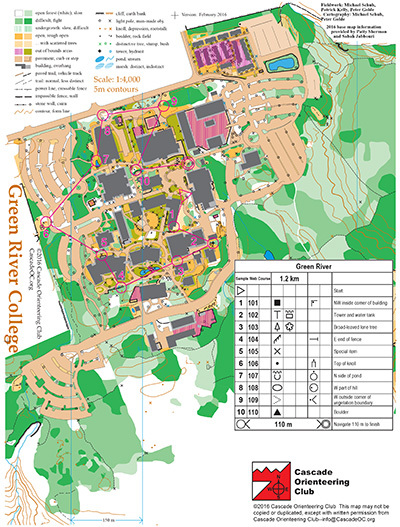 Green River College is almost like two venues–a dense college campus surrounded by thick forest and undergrowth with infrequent trails, some of which are prone to winter flooding. Over time, Cascade Orienteering Club has focused more on the campus, expanding that portion into a 1:4000 sprint map. As with any campus map, good awareness of building shapes, size, and direction–and the fact that you’re on a 1:4000 map–help with navigation. Note that the underground garage in the large, northeastern-most building is out of bounds and cannot be used for navigation. Other out-of-bounds areas are fenced. And as always, look both ways when crossing a road; there are lots of parking lots here! Note: Samples of the map are provided here for educational purposes only; the map shown here is not kept up-to-date. The course shown is a Beginner/Intermediate course, and actual controls do not exist in the terrain. 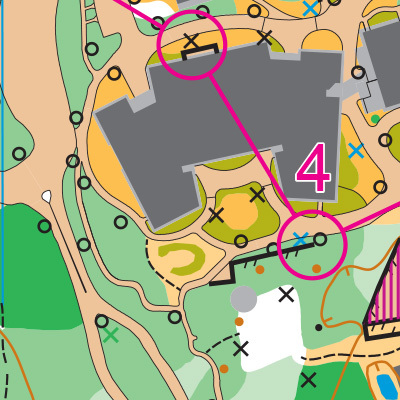 The purpose of providing these navigational and physical ratings below is to provide greater context for how challenging an orienteering course at this venue might be. For example, an advanced-level course at a local city park will be easier to complete than an advanced-level course in the mountains.